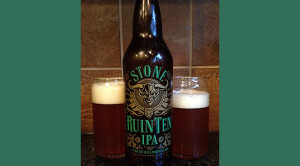 You’re warned about Stone RuinTen right there on the label: “a stage dive into a mosh pit of hops.” That right there is a good summary of this beer. While this brew isn’t only about the hops, it is pretty much about the hops. Pumping up their classic Ruination recipe, Stone has added more of just about everything: Piney hops, citrusy hops, floral hops, hoppy hops… you get the picture. They’ve also added more of the awesome maltiness that defines Ruination IPA and, despite the onslaught of hop presence in the nose it is still easy to pick up a sweet and bready malt profile. Rockin’! The complexity of the nose carries through as you drink this one. The malt profile is sweet yet slightly toasty, and manages to fight its way into the palate despite the immense hop profile. As I drank this one I was amazed at just how well balanced such a big beer can be. This one finishes with lots of resin presence that gets quickly pushed away by the malty sweetness. Nothing is overdone. Or everything is overdone to the point that nothing is inappropriately underdone. The doneness is done appropriately. That’s what I’m saying. Speaking of saying things, this is a very big beer. Drink a lot of it and you won’t be saying much of anything that makes sense. At 10.8% alcohol, it’s important you find someone—or a few people—to share this 22-ounce with; you’ll need help with this one. Whether you pair it with food or not, there ain’t nothin’ gettin’ in the way of this beer! I had planned on visiting the Stone Brewery this fall, but my plans changed from Southern California to Northern California. This beer reminds me once again that I need to find time to get to Escondido and visit the fine folks at Stone. They are true pioneers of the art of beer. This is one of their best works. Kevin has been drinking and brewing beer for more than 20 years, and enjoys re-capping the interesting craft and microbrews that find their way into his glass. Feel free to contact him at kevin@whopperjaw.net to talk favorites, but hold back on the technical questions – he sees himself as more of a beer nerd than a beer expert.